All two to 17-year-olds in the UK are to be offered annual flu vaccinations. If 30% take up the offer, there will be 11,000 fewer hospitalisations and 2,000 fewer deaths each year, the chief medical officer for England says. 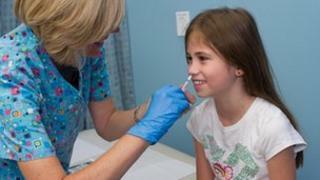 The children will be immunised using a nasal spray rather than an injection, starting in 2014 at the earliest. Children usually get a mild and sometimes unpleasant illness from seasonal flu. They rarely suffer complications. Youngsters who do are usually in the at-risk groups already offered a flu vaccine. Media captionProf Dame Sally Davies: "This should result in 11,000 fewer hospitalisations and 2,000 fewer deaths each year"
Chief medical officer for England, Prof Dame Sally Davies, told me: "Even with moderate uptake of 30% it's estimated that this should result in 11,000 fewer hospitalisations and 2,000 fewer deaths each year. Those figures are based on an unpublished study from the Health Protection Agency and the London School of Hygiene and Tropical Medicine. Prof Davies said most of the details of the immunisation programme had still to be worked out, including negotiating a contract price for the vaccine, which is marketed by AstraZeneca. The Department of Health said the company would not have the capacity to deliver enough vaccine until 2014 at the earliest. Fluenz is a live attenuated - weakened - intranasal vaccine, which has been used for several years in the United States under the brand name FluMist. In the minutes of its latest meeting the JCVI says the vaccine has "a good safety profile" and may be more widely accepted by parents and children because it is given in the form of a nasal spray. But side effects can include mild flu-like symptoms, including a runny nose or sore throat. Prof Adam Finn, consultant in paediatric infectious diseases at Bristol Royal Hospital for Children, said: "This is a good idea as we know it's effective and safe and flu can be a serious illness in childhood, not just in old age. "There should be time to do some more research before we introduce the vaccine to help us predict how well such a programme would be accepted and would work." The expectation is that under-fives will be vaccinated in GP surgeries and older children at school, but the JCVI says there are currently "far too few" school nurses to enable this to happen. The committee also said it would be a "huge expansion" of the immunisation programme, more than doubling the number of vaccinations offered to children before they reach adulthood. The JCVI says there may be "mixed reactions" to the flu immunisation plans and it recommends an information campaign for parents, children and healthcare staff. All children are immunised against rubella (also known as German measles). The virus causes only a mild infection in children. But if a woman catches the infection during early pregnancy it can cause serious damage to the developing baby. By immunising all children against rubella, it provides protection to others, as yet unborn. In the same way, extending flu vaccination to healthy children will provide most health benefits to others. Prof Davies said healthy children would get real benefits from avoiding flu, which could be a "miserable" disease. She added: "Don't forget it will also protect their baby brother or sister, and their grand-parents, so it really is worth doing."